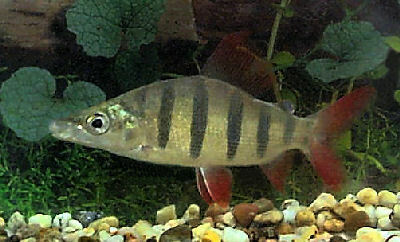 The Longsnout Distichodus is a handsome, large characin that is gold-toned with black and red accents! The Longsnout Distichodus Distichodus lusosso is a characin just like the familiar tetras. And like many tetras, it has bright, beautiful coloration. However, whereas tetras tend to be fairly small and affordable, the Longsnout Distichodus is fairly rare, quite pricey, and gets big. In nature, this fish can reach up to 15 inches (38 cm), though they tend to be somewhat smaller in the aquarium. Like its close relative, the Sixbar Distichodus Distichodus sexfasciatus, the Longsnout Distichodus has strong, black vertical bars on its flanks and bright red fins. These two fish are actually very similar in color, but this species can easily be distinguished by its noticeably longer snout, hence its common names, Long Snout Distichodus and Long Nosed Distichodus. Adult Longsnouts are also smaller than the Sixbar Distichodus. The Longsnout Distichodus is a very easy fish to keep, but because of its potential size, it requires a large aquarium. A juvenile will need at least 40 gallons, and a 55 gallon tank is the minimum size required to house an adult. Though they will feed on worms and other invertebrates, they are primarily herbivorous and will eat almost all vegetation growing in a tank. A planted aquarium is pretty much out of the question unless the plants are a very hardy species such as Anubias or Bolbitis. The Longsnout Distichodus tends to leave those types alone. Still, this fish needs some places of refuge to feel comfortable. Driftwood and smooth stones are good choices for decor and to create hiding places. The Long Nosed Distichodus can be kept in a community aquarium, but their temperament with tankmates is unpredictable. Some will be peaceful and co-habitat well with similar-sized occupants, while others will get ornery. Keeping them in schools is ideal and helps lessen aggressive behavior. This species is a good choice for an experienced fishkeeper with a large community tank. Most species of Distichodus are sold by their scientific name. Because their price is generally high, they are usually only purchased by advanced hobbyists. Most of these fish collectors don’t use the common names because they want to be 100% sure that they are getting the fish they desire. Hopefully someone will be able to commercially breed this and other rare fish so they will become more accessible to everyone. If and when this day arrives, the Longsnout Distichodus Distichodus lusosso will need a good common name. The Longsnout Distichodus Distichodus lusosso was described by Schilthuis in 1891. They are found in Africa: Bayari-sea, Lusosso, upper and middle Zaire River including Khinshasa, Angola, Cameroon, Katanga, and throughout the Congo basin. This species is listed on the IUCN Red List as Least Concern (LC) as it is widespread with no major threats identified. Other common names it is known by are Long Nosed Distichodus, Longnose Distichodus, and Long Snout Distichodus. This riverine species inhabits large rivers and swims in schools. They feed on soft vegetation, such as new shoots and leaves, as well as worms and other bottom-dwelling invertebrates. Social Grouping: Groups - They swim in schools. The Longsnout Distichodus is an elongated fish that becomes more deep bodied as it matures. It can get up to 15 inches (38 cm) in nature, though it is somewhat smaller in the aquarium. This fish has a lifespan of 9 to 12 years. The body is an orangish gold color marked with black vertical bars. They have red-tinged fins and a forked tail fin. The Longsnout Distichodus is quite similar to its close relative, the Sixbar Distichodus Distichodus sexfasciatus, but it has a longer snout and is much smaller as an adult. Its juvenile markings are quite striking, but as they mature, their patterning becomes subdued. Size of fish - inches: 15.0 inches (38.10 cm) - These fish grow up to 15 inches (38 cm) in nature, but they are smaller in the aquarium. Lifespan: 12 years - They have a lifespan of 9 to 12 years. Longsnout Distichodus are easy to keep, but because of their adult size, they require a large aquarium. This fish makes a good choice for an experienced fishkeeper with a large community tank and a strong filter. 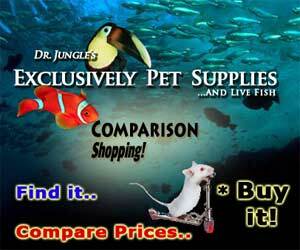 These active and boisterous fish need tankmates that are equally-sized and just as impetuous. Aquarist Experience Level: Advanced - This fish is expensive and requires a large tank, so generally it is only kept by more advanced aquarists. The Longsnout Distichodus are omnivores, but much of their diet is plant matter. In the wild, they feed on soft vegetation, such as leaves and new sprouts, as well as worms and other bottom-dwelling invertebrates. For optimal health, in the aquarium, their diet should consist of large amounts of vegetable matter. They will accept most prepared foods, including flakes and small pellets, and will greedily eat fresh or frozen foods. They like to eat plants, so provide greens like Spirulina flake and blanched spinach. Occasionally, give them a piece of leaf lettuce to nibble or some peas. Supplement with bloodworms and other small, meaty treats. Longsnout Distichodus are big fish that put a large bio load on the aquarium, so they need ample filtration. Aquariums are closed systems, and regardless of size, all need some maintenance. Over time, decomposing organic matter, nitrates, and phosphate build up and water hardness increases due to evaporation. To combat these ever-changing conditions, water should be replaced on a regular basis, especially if the tank is densely stocked. Water changes of about 30 to 50% are needed every other week, depending on the bio load, to keep this fish happy and healthy. The Longsnout Distichodus will swim in all parts of the aquarium. These fish are easy to keep, but because of their large adult size, they require a large aquarium. Juveniles can be kept in a 40 gallon tank, but adults require a larger tank of at least 55 gallons. They are hardy, disease resistant, and can handle a variety of water conditions. They need clean water, so good filtration is important, and they will appreciate a moderate water flow. Provide a gravel or sand substrate and a decor of driftwood and smooth rocks. These fish will devour most plants but tend to ignore some species, such as the Anubias Nana. Longsnout Distichodus have a reputation for being excellent jumpers, so make sure to keep the tank covered. Minimum Tank Size: 55 gal (208 L) - Juveniles can be kept in a 40-gallon tank, but a larger tank of least 55 gallons is needed to keep an adult. Water Region: All - They will swim in all parts of the tank. These fish are peaceful as juveniles, but as they mature, they become rather unpredictable. They have a somewhat pushy temperament, so they should be kept with other robust species. Some Distichodus lusosso can become aggressive. Keep them with other fast-moving fish that do not have long fins. They usually will not bother bottom-dwelling catfish. This schooling fish will be less aggressive if kept in a school of 5 or more. However, because of their high price, this is may not be practical for the average hobbyist. Tankmates could include other large species of Characins, Bichirs, Cyprinids like the Tinfoil Barbs, Plecostomus, and Thorny Catfish. Same species - conspecifics: Yes - Temperament will vary greatly from individual to individual. These fish should be kept in small groups of 5 or more to diffuse their aggressive tendencies among their own kind. Peaceful fish (): Monitor - Only other large, robust community fish should be kept with the Longsnout Distichodus. Shrimps, Crabs, Snails: May be aggressive - They eat bottom-dwelling invertebrates in the wild. Plants: Threat - This fish will eat many of the plants commonly kept in aquariums. The Longsnout Distichodus has not been bred in captivity. In the wild, its courtship and spawning behaviors are largely unknown. Like other large characins, it probably migrates before spawning. At the start of the rainy season, many African species travel long distances upriver, entering flooded forest areas to feed and spawn. For a description of breeding characin fish, see Breeding Freshwater Fish: Characins. Longsnout Distichodus are hardy, and disease is not usually a problem in a well-maintained aquarium. That being said, there is no guarantee that you won't have to deal with health problems or disease. Anything you add to your tank can introduce disease. Take great care and make sure to properly clean or quarantine anything that you add to an established tank so as not to upset the balance. A good thing about the Longsnout Distichodus is that due to their resilience, an outbreak of disease can often be limited to just one or a few fishes if dealt with at an early stage. When keeping more sensitive types of fish, it is common for all fishes to be infected even before the first warning signs can be noticed. The best way to proactively prevent disease is to give your fish the proper environment and a well-balanced diet. The more closely their environment resembles their natural habitat, the less stress the fish will have, making them healthier and happier. A stressed fish is more likely to acquire disease. As with most fish, the Longsnout Distichodus are prone to skin flukes, parasitic infestations (protozoa, worms, etc. ), ichthyobodo infection, parasitic infestations (protozoa, worms, etc. ), bacterial infections (general), and bacterial disease. Aquarists should read up on common tank diseases. Knowing the signs and catching and treating early makes a huge difference. For information about freshwater fish diseases and illnesses, see Aquarium Fish Diseases and Treatments. The Longsnout Distichodus or Long Nosed Distichodus are occasionally available but usually command a high price.